You forgot to download FocusWriter	. Click the link below to download it. The problem with most text editing environments is their white backgrounds which will tire your eyes quickly. You may also get distracted from your work, due to an automated feature or even something on your desktop. With FocusWriter, typing large amounts of text will become more comfortable. Its interface is more pleasant to look at and you can set it to full screen, so you will not get distracted. It comes with additional tools as well, so you can use it for more than typing text. 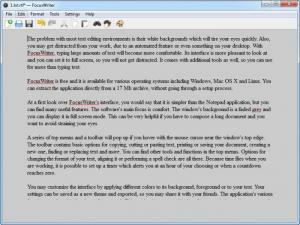 FocusWriter is free and it is available for various operating systems including Windows, Mac OS X and Linux. You can extract the application directly from a 17 Mb archive, without going through a setup process. At a first look over FocusWriter's interface, you would say that it is simpler than the Notepad application, but you can find many useful features. The software's main focus is comfort. The window's background is a faded grey and you can display it in full screen mode. This can be very helpful if you have to compose a long document and you want to avoid straining your eyes. A series of top menus and a toolbar will pop up if you hover with the mouse cursor near the window's top edge. The toolbar contains basic options for copying, cutting or pasting text, printing or saving your document, creating a new one, finding or replacing text and more. You can find other tools and functions in the top menus. Options for changing the format of your text, aligning it or performing a spell check are all there. Because time flies when you are working, it is possible to set up a timer which alerts you at an hour of your choosing or when a countdown reaches zero. You may customize the interface by applying different colors to its background, foreground or to your text. Your settings can be saved as a new theme and exported, so you may share it with your friends. The application's various functions can be added on its toolbar as well. This can be done on a tabbed preferences window, where you need to select individual functions by clicking check boxes. FocusWriter lets you work, without distracting you with any automated features that will instantly correct or align your text. The colors of the interface are pleasant and they will not tire your eyes as you type. The application may seem basic, but it provides many useful features. The application supports RTF and ODT formats, but it can not save as plain text. If advanced text editors are too distracting, FocusWriter is an excellent solution. While using this application, you can focus on typing your text and nothing else. You can download FocusWriter free here.